Taiman Blues, directed by Satoshi Dezaki. Three OAVs (#1 and #3 are 30 minutes; #2 is 60 minutes), and two 47-minute OAVs. April 25, 1987, November 10, 1988, and May 25, 1989; and April 5 and May 25, 1990. “Taiman” is Japanese gang-slang for a one-on-one fight, as opposed to a rumble, which is everyone in a gang fighting another gang. 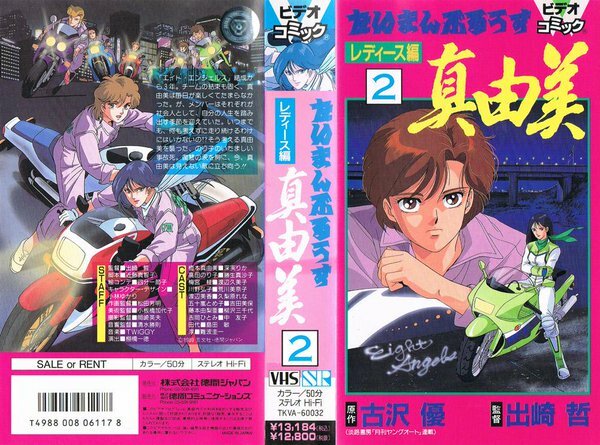 Taiman Blues was a motorcycle-gang manga by Yū Furusawa that was divided into two short OAV series: one about the boys’ gangs, and one about a girls’ gang. The specific titles are Taiman Blues Shimizu Naoto Hen (“Hen is Chapter” in Japanese), and Taiman Blues Ladies Hen. Except that if you look at the Japanese titles, they don’t look like they say anything like “Taiman Blues”. All five OAVS were released by Tokuma Japan. The two Ladies OAVs were produced by Magic Bus; which probably produced the three “boy’s gang” OAVs as well, but I haven’t found a production credit yet for them. Taiman Blues Shimizu Naoto Hen is about, according to one summary, “A tale of rivalry between two gangs, MND and Laku, and the personal vendetta between MND’s Naoto and Laku’s Yota.” There is nothing else about it on the internet. 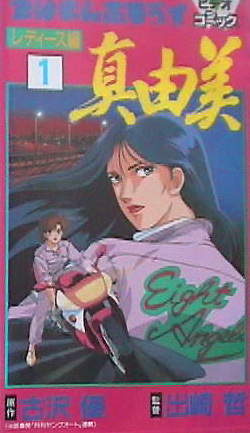 The first of the two episodes of Taiman Blues Ladies Hen – Mayumi, was subtitled and added to the internet just last December. Hopefully Kingmenu, the anime-fan group that did this, is working on more. I feel that thanks and more recognition are due to whatever group is finding forgotten OAVs like this and subtitling them in English for the American anime fans. A teen ladies biker gang, the Eight Angels, is getting ready to ride out. The leader, Noriko, tells beginner Mayumi to follow her. As they ride, Mayumi reminisces how life has improved so much for her since six months ago. The rest of the OAV is a flashback. Mayumi Hashimoto is fifteen years old. She left home in a rural town to escape being sexually abused by her new stepfather. She took the train to the end of the line at Osaka (pronounced Ōsaka), and expected to start a new life there with only ¥2,000. (About $20.00.) She is seized by a biker gang and forced to ride on their motorcycles with them. 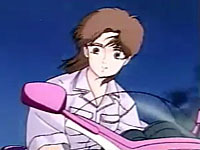 When the police stop them, she is about to be arrested as one of the gang when she is rescued by Noriko Takada, an independent 19-year-old office worker, who claims her as a friend and points out that she is not dressed as a biker. One of the other young attendants is Jun, who is a friend of Tachiro. They are both members of the Big Bear biker gang, but don’t show their biker membership during the daytime. Tachiro asks Jun who introduce him to Mayumi. Jun doesn’t, but Tachiro strikes up an innocent fried ship with her anyway. Apparently the Esmo station is neutral territory between the Big Bear gang and the Red Sharks, the gang that had previously grabbed Mayumi; but they get their gasoline there. They recognize Mayumi, and see that she has become friendly with Tachiro. They lure her into a car by telling her that Tachiro wants to see her. Jun phones Noriko that the Red Sharks have just taken her. The Red Shark member who has lured Mayumi takes her to where the whole gang is waiting. The Red Shark leader prepares to toy with Mayumi, but before he can start, Noriko arrives on her cycle. She tries to confront the leader, but he orders Hiroko Kawano, the head of the Red Sharks’ ladies auxiliary, to take care of her – to have a taiman. The women fight and Noriko wins. Hiroko says that they’d better let Noriko and Mayumi go, but the leader refuses to listen to any woman. Hiroko is tired of taking men’s orders and clubs him, telling Noriko and Mayumi to escape. Another Red Shark girl, Katsura Umemiya, helps Hiroko to flee with Noriko and Mayumi on her cycle. The other Red Sharks pursue them, but a police car helps them get away. Hiroko urges Noriko to form a girls’ gang. 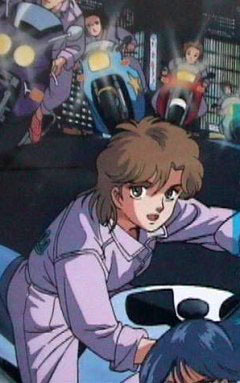 Noriko refuses to start a gang with its stereotypical fighting, but agrees to consider starting a team for riding just for pleasure. Mayumi breaks up with Tachiro because he’s a biker; she feels that there’s no difference between the Red Sharks and the Big Bear gang that Tachirro is in. The Esmo gas sation where Mayumi works is vandalized, obviously by the Red Sharks. The four girls go to the Red Sharks and tell them they won’t report them to the police if the gang leaves them alone. (I can’t tell whether the girls actually have evidence against the Red Sharks, or they threaten to frame them.) The Red Shark leader demands that Noriko fight a taiman with a Red Shark member, Yamada. Niriko wins, and vows to definitely start a girls’ bike-riding team. The girls agree that three aren’t enough for a team. (Mayumi doesn’t have a driver’s license or a motorcycle yet.) Hiroko and Katsura think they may be able to get some more girls from Naniwa-no-Hana (Flowers of Naniwa – Naniwa-ku is one of the 24 wards of Osaka), the ladies’ auxiliary of the Big Bears. They visit them to ask their leader, Oda-san, if she is willing to spare some of her junior members – hangers-on that she wants to get rid of anyway. The Naniwa-no-Hana are worried that Noriko will eventually turn her team into a gang to challenge them, but Tachiro and Jun, who are there, speak up for them. The four girls meet at Noriko’s apartment for a planning session. Four girls from Naniwa-no-Hana come to join them: Hitomi Yoshioka, Mika Watanabe, Tomiko Igarashi, and Yuria Fujimoto. They have a team. Tomiko agrees to desgn their uniform, and Mayumi will get her license. They need a name that doesn’t sound like a Yakuza gang, and Mayumi suggests the Angels, which becomes the Eight Angels. They are just relaxing after their first ride when the Big Bear gang confronts them and orders them to keep off their turf. Noriko says they will ride wherever they want to, and they are not interested in claiming a territory and fighting other gangs, but the Big Bear leader says they don’t have a choice. Noriko challenges the Big Bear leader to a taiman, but he refuses to lower himself to fight a woman – he demands that they submit to the male bikers. They refuse and there is a gang rumble (check out all the action in extremely limited animation) which the Eight Angels win. As the OAV ends, the Eight Angels ride off victoriously, with Tachiro and Jun deserting the Big Bears to join them. But this is only the first OAV of two. Presumably the rest of the Big Bears are still after them, and they already have the Red Sharks as enemies. It looks like the Eight Angels will have to become a traditional biker gang and fight for their survival, whether they want to or not. I am frankly unfamiliar with these OAVs, and I don’t know where the story is going. This shows that in addition to the old OAVs that most anime fans and scholars have forgotten about today, there are still “unknown treasures” for us gaijin. About Osaka: in general, residents of Tokyo consider Osakans as comic-relief country bumpkins, or in more serious plots, to have a casual attitude towards authority. See Azumanga Daioh!, a high-school comedy where a transfer student from Osaka is nicknamed “Osaka” and assumed by the other students to have all the Osakan stereotypes (which she doesn’t), and Magical Shopping Mall Abenobashi, where the characters all have exaggerated Osakan traits and talk with thick Osakan accents. When A.D. 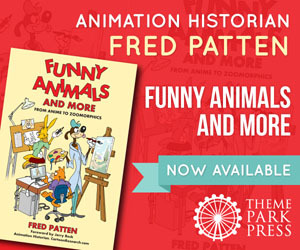 Vision translated this for American release in English, they substituted thick cowboy/Texas accents. I have to confess that I’ve tried to listen closely, and I can’t tell the difference between an Osaka accent and a Tokyo accent. The Osakans resent this, but Tokyo is where 99% of the anime industry is located. Hiroshima is the other comical locale. Hiroshima has a tough-guy/crime lord reputation, like Chicago during Prohibition. Breaching copyright law is a legal no-no. But in this case, I can’t get worked up about it. Kingmenu subtitled a 26-year-old OAV that virtually nobody in America has any interest in – that they didn’t even know about. 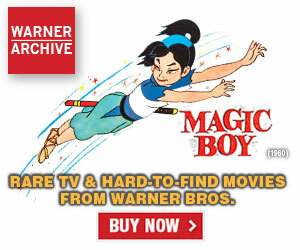 Would Funimation be interested in this today? So it’s not like the illegal subtitling has cost the copyright holder any money. As if most fan have legal representation to go phone up plenty of TV distributors and other potential clients asking about getting behind said productions. That was a stretch when you’re not IN the industry!